For many years my vinegar repertoire was limited to three types – white, red wine and balsamic. I was happily ignorant of other types. Eventually my vinegar world expanded to other types, like making my own infused versions, as well as champagne and finally apple cider. Before trying it I just assumed it was cloying and sweet. It is made from cider, isn’t it? About the flavor I was very wrong, and discovered that there is more to apple cider vinegar than the apples. The vinegar is very easy to make. Simply put, toss some chopped apples and water into a jar, cover it and put it in the dark for six months. Some people add sugar or honey, but it is not necessary. After scraping some gray scum off the top (which is supposed to happen) spoon it out and start using it. Another method is putting apple cider (made with winter or fall apples) in a jar with some special yeast. Not the kind used to make bread, but the kind used in wine making. Stir it daily for about a month until it is the strength you like then use it up! The third and final method is walk into the local grocery store, locate the condiment aisle and search for the golden colored vinegar squeezed between the white and wine vinegars. I prefer to use Bragg Organic Raw Apple Cider Vinegar when I can find it, which is often. There are also pasteurized and filtered versions, but based on my research the heating and filtering processes take away essential nutrients, probiotics and enzymes found in the raw, unfiltered type. Now that you know how to make or acquire the vinegar, here are some reasons why you should use it. First, it helps your body work better in a few ways. It helps digest food and boost immunity by helping good bacteria naturally occurring in your stomach do their job. It also helps with constipation, moving foods along the digestive system more smoothly. It is easy to add it to your meals, in salad dressings, sauces, as an ingredient in the brine of pickled vegetables, or just mix some with water and drink it before you eat. Be careful when you drink it though – apple cider vinegar is very acidic. If you want to make a drink with it make sure it is sufficiently diluted in water or another beverage (8 ounces for every tablespoon of vinegar). Straight vinegar can eat away at enamel on your teeth or the lining of your esophagus. It has not happened to me, but sure sounds like it hurts! Drinking some with a starchy meal evens out your digestive system by balancing blood glucose levels. Blood sugar of Type 2 diabetics has also been know to drop consistently when ACV is included in your morning beverage. More health benefits include some protection of LDL particles, helping to reduce cholesterol. It is also said to help reduce blood pressure. I am intentionally not including links or references in this newsletter because I am skeptical about any single product that is shown to ‘cure’ or ‘fix’ health problems. If you have health problems it is important to figure out what combination of food and physical elements in your life work for you and enhance your positive health conditions. I do encourage you to do some research and find out if apple cider vinegar could help you, especially if you have sensitivities to grains, gluten or sugar. ACV is also known to help your outside body parts too. Dilute it 1:1 with water and use it as a toner for your face. Rinse your hair with a stronger 2:1 ratio and clear up any build up on it from using shampoos and conditioners. After rinsing it out your hair will be soft and won’t smell like vinegar. I promise! Works great on my naturally curly hair without weighing it down. You can also pour a quart in your warm bath to detoxify and sooth muscle aches and pains. I am far from saying that apple cider vinegar is a cure all or will make you skinny, but it has been shown to help, along with healthy eating and other positive life habits. Here at Grain Free Haven we use apple cider vinegar in Power Bread and Power Buns. Since we don’t use yeast we rely on ACV as an acid, working with baking soda as a base, to be leavening agents. It is what makes our bread and buns rise with pleasantly fluffy and light results. Come by for a sample of our lovely bread, or if you have already experienced the wonderful taste, come stock up – it freezes well! There is no need for sugar or sweetener in this recipe. 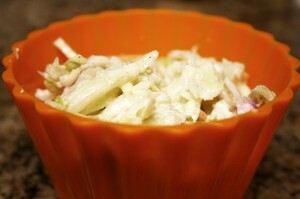 The apple cider vinegar gives both sweet and tart to the slaw dressing, giving you the benefits of the vinegar while bringing out the best qualities of the colorful cabbages. In a large bowl combine garlic, mayonnaise, vinegar, salt and pepper. Whisk until combined. Add green cabbage, purple cabbage, carrot and onion. Toss vegetables until coated with dressing. Chill for at least one hour and toss again before serving. Saturday, February 20, 2016, 8am-5pm: Dallas Farmers Market. If you are like me you wonder if our North Texas winter is really over. Based on this Saturday’s forecast it looks like winter may be behind us! We are doing our best to stock up each weekend, making sure we don’t sell out of Power Bread before you come by! As always, we have our Peanut Butter Chocolate Chip Cookies and wonderful dairy free, sugar free Coconut Macaroons! Sunday, February 21, 2016, 10am-5pm: Dallas Farmers Market. Don’t worry about the hint of rain we might get, for we are all under the huge pavilion of the Shed! We will be offering just for you a collection of muffin flavors to choose from and a variety of nuts, so stock up to make sure you can be sated during your afternoon snack all week! If you come by my booth and tell us this week’s discount code you will get $1 off any purchase of $15 or more! The code for this week is APPLE CIDER VINEGAR!